Anyone making an effort to motivate people to study the Scriptures is to be highly commended; and those inspired by God to found a Bible school certainly deserves recognition. The production of your curriculum and the development of your programs can represent years of labor intensive work. Starting a Bible Institute is a very great accomplishment, and accreditation is the public crowning of that achievement. Of course, every Theological Seminary was unknown when it first began, and it usually requires years of consistent performance to build a good reputation. Christian educational institutions need all the credibility that they can get, but it's usually difficult to become nationally known. But with some outside assistance you can become more widely know faster. In the commercial world of today, consumers have learned that all is not what it appears to be so "buyer beware." Likewise, if a student is going to expend time, effort, and money to obtain a degree, it is particularly important to know of the legitimacy, integrity, and prestige of the institution from which it comes. And how can a prospective student know if the school he is considering is of good quality or not? Well, they realize that an outside viewpoint is more likely to be objective. So, an accrediting agency is a kind of consumer protection agency in the field of education to ensure as far as possible that a school is what it says it is and does what it says it does. So the first question in the mind of an informed prospective student is, "Is your school accredited, and by whom?" That you offer valid programs and meet with acceptable standards in the world of education. That what you promise, you deliver. By definition, the word "accredit" means to authorize, endorse, and officially approve of. What ordination is to a minister, accreditation is to a school. Accreditation is a group process by which schools voluntarily agree to participate in a set of established standards in order to encourage quality education. Schools are not legally required to become accredited, but it is a very desirable standing. Accredited status means a school has voluntarily undergone a comprehensive examination to determine that it operates at a worthy level of performance. There as secular education and there is religious education. Secular schools seek secular education, and sacred schools receive sacred accreditation�each by their own peers. Religious institutions need no secular accreditation because they offer no secular degrees. Secular accreditation associations in turn are recognized by governmental agencies. They trace their authority back to the capitol of a country, like Washington, D.C. Religious accrediting associations are recognized by the Church of Jesus Christ, which has no supreme central office on earth. Our authority is derived directly from Heaven. Civil and religious interests are different and have separate realms of jurisdiction. The State is not superior to the Church. The Church need not wait for approval from the secular world. Civil agencies should not be dictating standards of Christian education, any more than a police officer should be directing the worship of God. Theological Seminaries should not be accredited by accrediting associations that are "recognized" by an agency of the federal government, because it is contrary to the Biblical principle of "Separation of Church and State," indicated by Christ when He said, "...Render unto Caesar the things that are Caesar's, and to God the things that are God's..." (Mark 12:17). What business does a Christian educator have going to the world of unbelievers for recognition and acknowledgement when 2 Corinthians 6:14 clearly tells us, "Be ye not unequally yoked together with unbelievers: for what fellowship hath righteousness with unrighteousness?" A Christian educational institution securing accreditation from an association which is attached to a governmental agency is a Scripturally condemned and unholy union as James 4:4 says, "Ye adulterers and adulteresses, know ye not that the friendship of the world is enmity with God?" Accrediting standards differ widely from agency to agency. Some are next to impossible to get into, and others don't check anything. Any so-called accrediting society that offers to accredit your school without knowing anything about your school is just trying to sell you an expensive piece of paper. As there are bogus schools that sell Doctorate degrees, even so there are bogus accrediting agencies that will accept anyone who pays their fee. It is highly unethical for a Bible Institute to accredit itself. It is like a minister ordaining himself. But such worthless self-accreditation is exactly what most degree mills do. They try to conceal the fact that their so-called school and so-called accrediting association is at the same place by offering no address for the accrediting association, which is why some accrediting associations are unlocatable. But the W.W.A.C. has nothing to hide because we know where we stand with God and with man. We also know that we can't please everyone, but we are not afraid of honest questions and reasonable requests. All of our member schools are welcomed and encouraged to list our name and address in their catalogs and bulletins. And you may rest assured, that when called upon to verify your accreditation with us, we shall render ample support. Upgrade standards of scholarship among evangelical educational institutions. To award certificates of accreditation to deserving schools. To continue to monitor compliance with set standards. We specialize in Theological Seminaries, Christian Colleges, and Bible Institutes of all sizes, including both traditional and alternative programs. We are also concerned with helping any formal ministry teaching the Word of God in an on-going relationship between instructor and students, which may not fit into any denominational mold, to develop into a viable school. The W.W.A.C. is part of the Full Gospel of Christ Fellowship, Inc. The Board of Directors of the F.G.C.F.I. has formally announced its full recognition, endorsement, and approval of the W.W.A.C. The W.W.A.C. holds itself accountable to God, the Church, the laws of the land, and the general public. We are non-governmentally connected and we do not engage in partisan political activities. Unlike regional accrediting associations which are limited to one area, we were established as a multi-national association of Christian Educational Institutions. All officers and faculty of your school must exemplify good Christian character. Immoral or unbecoming conduct by a staff or personal must not be tolerated. If you are going to confer academic degree, you should check with your state's Higher Education Coordinating Board to obtain religious exemption. Most states do not charge a fee for this. Faculty to student ratio must reflect a realistic work load, so teachers can provide sufficient care and encouragement to individual students. Admission policies must be in accordance with federal anti-discrimination laws (i.e., students must not be excluded from any educational program on the grounds of race, color, or national origin). Institutions must provide students with a catalog, bulletin, or information sheet describing its curriculum, certificates, and fees. 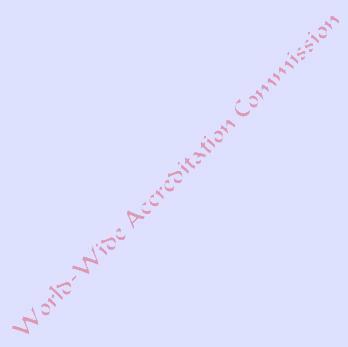 The literature should also not mislead the reader into believing that the accreditation from the W.W.A.C. is connected in anyway with any governmental agency. All degree candidates should hold a high school diploma, a G.E.D., or the equivalent. Christian schools must understand their vital relationship with local Churches; inasmuch "...as Christ also loved the church, and gave himself for it..." (Ephesians 5:25). The W.W.A.C. includes some of the most Spiritually effective schools in the world, as we accept only good Bible teaching institutions. We accredit Christian schools on both the undergraduate and graduate levels�both colleges with campuses and colleges without campuses. But none of our Christian educational institutions offer any secular programs or degree. The W.W.A.C. is whole-heartedly dedicated to foreign missions and especially happy to include colleges and universities located overseas, provided they communicate with us in English. Some of our schools started out as modest as a weekly class for local students in a storefront building. And we included some small special interest institutions who have elected non-traditional methods of instruction delivery such as audio and video tapes, and the popular correspondence courses. The W.W.A.C. will not accept into membership any colleges or universities which include in their curriculum courses on metaphysics, parapsychology, psychical research, hypnotism, E.S.P., Eastern-types of meditation, or the theory of evolution or reincarnation. We reject all so-called new-age, neo-paganism, humanistic, occultic, and any other ungodly teachings. During the accreditation process, an on-site inspection is made by an outside peer, where practical. The purpose is to make observations and gather data to determine if a school meets the set of standards of the W.W.A.C. We have representatives in many cities of the U.S.A. that could visit your school to acquire this first-hand knowledge for evaluation, although in some places, especially overseas, this must be handled by special evaluation reports. It is unnecessary to insist upon expensive on-site inspections in some cases because of the high degree of mutual respect and trust between the W.W.A.C. and our member schools. As the Church has traditionally recognized three ranks of those called to the ministry: 1) Exhorter, 2) Licensed, and 3) Ordained; even so, the accreditation process is identifiable in three distinct phases: 1) Applicant, 2) Associate, and 3) Accredited. But with the W.W.A.C. you will not have to wait three to five years to get through the steps. APPLICANT or PROVINCIAL STATUS: This means that a school has submitted an application with the fee, and we have acknowledged that the school is in existence. ASSOCIATE or CANDIDATE STATUS: The interval between our examining your application and your receiving a Certificate of Accreditation. It may mean that you are working to meet a certain requirement to rise up to our standards or it might mean that you are awaiting an on-site visit and report approval, or that we are in the process of verifying the special evaluation reports. Hopefully this will be a relatively short period of time. FULLY ACCREDITED MEMBER STATUS: This means that the on-site visit report has been approved, or the special evaluation reports have been verified and accepted, and that the W.W.A.C. has concluded that you have met or exceeded the minimum standards set, and that your school have been awarded the Certificate of Accreditation. Upon our determination that your school has satisfactorily met or exceeded the predetermined professional standards of the W.W.A.C., you will receive a beautiful Certificate of Accreditation to be displayed in your school office or classroom for all to see. It certifies that you are recognized as a reliable Christian school engaged in teaching God's Word. It shows that we have judged your school as a legitimate and worthy school, offering quality instruction. It states that you are a member in good standing with the W.W.A.C. and indicates that you are pledged to maintaining Christian educational excellence. The W.W.A.C. keeps a confidential file on your school, containing your application, the on-site visit or special evaluation reports, all legal documentation, and all other supporting information. This file is maintained perpetually. Each member institution id also required to submit an annual report on the form provided by the W.W.A.C. at the time. Any member school which fails to maintain the standards of the W.W.A.C., or fails to submit the annual report and renewal fees within thirty days after notification, will be placed on probation until such deficiencies have been rectified.